"Domestic Sluttery: The home and lifestyle blog for women who have better things to do. Domestic Sluttery is a new way of life. Written by women who cook, decorate and design (usually with a glass of wine close to hand) without giving up our lives. We want to make your home your own, without doing very much at all. So you can get on with the rest of your life". Do you see what I mean? Is that you nodding your head in agreement there? Thought so! When it comes to baking, every girl needs a secret weapon in her recipe collection. Be it that scintillating lasagne you painstakingly labour over the first time you cook for someone you'd quite like to get to know better, or the cake you only ever assemble so you can get the object of your desires to fall at your feet – whatever it is, when it comes to affairs of the heart, a little piece of kitchen magic can often go a long long way. 'Blueberry Boy Bait' is the trick that I keep up my particular sleeve. And with good reason – not only is it it filled to the brim with delicious jammy summery fruit which is packed into an obscenely buttery sponge and swathed with a sheet of cinnamon sugar - but it also has possibly the best name of any dessert ever. I mean think about it. Boy Bait. Who could ever resist a slice of a cake with a name like that? The story as to how this dessert got its name is also utterly charming. Back in the 1950s, a (rather devilishly clever) 15-year-old girl won second prize in the junior division of a Pillsbury baking contest with this cake, and told the judges that it got its name from the effect it had on the neighbour teenage boys - one bite and they were hooked. And take my word for it, after one nibble of this cunningly tasty little dessert, you (and any boys you might be baiting) will be too. Heat oven to Gas Mark 4 (350 degrees). Grease and flour a 13 by 9-inch baking pan. Whisk the flour, baking powder, and salt together in medium bowl. Now, cream your butter and sugar together with a hand blender for around two minutes until it's turned nice and fluffy. Add eggs, one at a time, beating until just incorporated into the mix – make sure to scrape the sides of the bowl as you're going along so you don't miss a bit! Now add roughly one-third of the flour mixture to the ingredients until it's all started to come together; then beat in half of milk. Once that's done, beat in the other half of remaining flour mixture, then remaining milk, and finally remaining flour mixture. 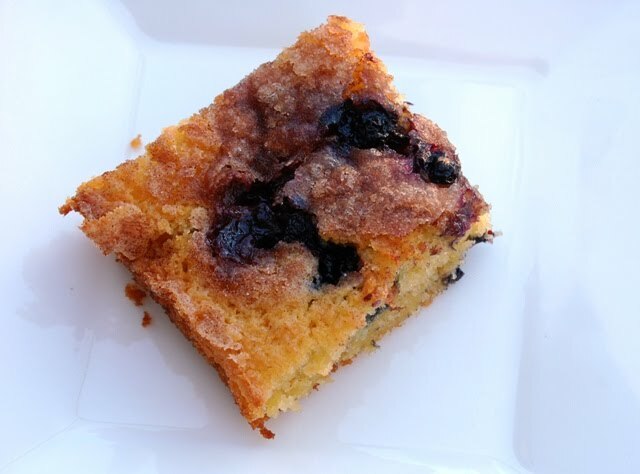 Toss blueberries with remaining one teaspoon flour. Using rubber spatula, gently fold in blueberries. Spread batter into prepared pan. Bake until toothpick inserted in centre of cake comes out clean, 45 to 50 minutes. Cool in pan 20 minutes, then turn out and place on serving platter (topping side up). Serve warm or at room temperature. Mmmmmmmmm .......thank you Miss Cay for such a delicious treat and for the pinch of sauciness thrown in for good measure. It looks so good! If I know some of you out there like I think I do, I imagine you're on your way to the kitchen as I speak. So, remember to send us a link to your finished product if you indulge in some Blueberry Boy Bait-ing of your own! It's in the oven - smells delicious! I must say, it's very considerate of you to have your anniversary on a weekend where I am child-free, so have lots of time to browse and play! And the verdict is - delicious! The cinnamon sugar crust is especially delicious. I think I needed to cook it a bit longer but that was down to driver error, not the recipe.